I just talked with our rep at CHI. They recieved all our documents from last week. And her exact words were, "Everything looks perfect. They will be approved by Russia, without a doubt." Now, that's nice to hear! While our kids were on Spring Break last week, we spent a beautiful sunny day at the Zoo with shorts on! Our grand plans this weekend are to stay inside and snuggle up with our kids to stay warm. A great itinerary for a wintry "spring" weekend! This week Rob and I got three difficult documents finished which were pretty tough to complete. After all the hassle with the CPA docs, Russia added another form! Plus, we were missing a tiny detail on the originals. We had to go back to the CPA - during tax season - and ask if he could complete the forms...again! Oh, my goodness, what a blessing that man has been to us! He's in the process of adopting, too. So, he has an understanding that few can truly know. After the papers were signed and notarized I had to take them to be appistilled at the Secretary of State in Missouri because that's where they were notarized. Did you know that fingerprints expire after one year? My dad was in shock about that one! He said, "If someone dies when they're 80, can't you identify them with the fingerprints from birth?". That's the impression I had! But, apparently, these days, they only work for one year. So...Rob and I had to go back to Homeland Security to have our fingerprints updated on our I-171H form. For those who don't know, that is the form that costs a lot and takes a long time to be returned by the government. And, we cannot take our little girl out of Russia without it. Not something you want to expire if you can help it! Then the last thing we had to complete was an update on our Picture Pages. We have sent Russia at least 5 copies of our pictures from our house and family. This one needed more pictures. And, like always, it had to have a cover letter that had to be completed and signed by our social worker, then notarized and then appistilled in Topeka before I could send it. Nothing is easy! So, at this very second all our paperwork is updated and nothing else looks to expire until this fall. "Oh, Lord, let it be so!" Still no news on travel dates. In some ways our family is on "pause". But mostly, we just have another "DVD" playing a lively show while the "paused" one waits to be started again! Well, we sent our updated certified Marriage Certificate to Russia two weeks ago. We still have not heard a definitive answer if that was the document they were referring to a month ago. It's sometimes hard to get the lines of communication open between us and Russia. We're just really praying that when our names come up again at the Dept of Education in Moscow they won't say, "Oh yeah, this family again. We're still missing their document..."
But, some encouraging news. Amazingly, we got our new and revised Financial Statement completed for Astrakhan. It was extremely detailed! 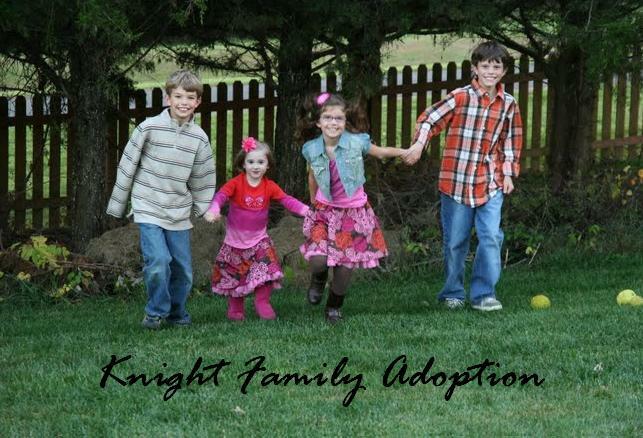 Praise God we found a CPA who has been through the adoption process. He was a huge blessing to us! The past two weeks have been very good. We have seen over and over again how personal God is. I heard a speaker say, "Sometimes we're waiting to hear a voice, when God has already spoken a verse". He has spoken - almost cheered - several scriptures to me these past two weeks. They have come up several times through different sources. One of those cool things God does, you know? I am trying to memorized every scripture that God drops into my heart. It's been fun. Here are two from the past week. I Thessalonians 5:16 -18 "Always be joyful. Never stop praying. No matter what happens, always be thankful. For this is God's will for those who are in Christ Jesus". Psalm 34:1-4 "I will praise the Lord at all times. I will constantly speaks His praises. I will boast only in the Lord. Let all who are discouraged take heart! Oh, let us tell of the Lord's greatness. Let us exalt His name together. I prayed to the Lord, He answered me, freeing me from my fears". What a personal, sweet God we have. The verses from Psalms are especially cool. I am thirty-four and we have four kids - counting our Rooskie baby. That's what my uncle affectionately calls her ;) So, we wait for His plan to unfold. And, we will never stop praying for our sweet little girl across the world waiting for us!